Electrical Service Upgrades - Increase Amperage Today! Do you have old wiring installed in your home or business? R&R specializes in boosting your service. *Your business is planning an expansion but a new electrical panel will be needed to safely accommodate the power draw. *Your electrical system is connected to an aging and outdated fuse box. *Your facility does not have sufficient room to add new electrical circuits. *A major piece of machinery or appliance was recently installed at your facility. *The electrical panel at your facility or residence is no longer manufactured or has been subject to a recall. *Lights dim or go out completely at your building if large appliances or machinery is switched on. It’s also vital that you have a correctly bonded and grounded system for your electrical service, which ensures a safe route for the current in the event of an electrical fault. R & R and Sons is the contractor to call for this important electrical issue. With inspections and maintenance from our experienced staff, your property will meet safety standards with work performed under all necessary permits; R & R and Sons is a licensed and insured company with a long history of providing electrical service upgrades to our residential, commercial and industrial customers in Batavia, the Tri Cities and throughout northern Illinois. Call us at 630-406-1527 for an expert upgrade that will lead to energy savings and improved safety! Our experienced, certified electricians will perform a detailed evaluation of your system and recommend the best solutions for your property. We are fully insured in case of an emergency. Don’t deal with a company that is not licensed. We are fully licensed and have the knowledge behind it. Our technicians are some of the best electrical professionals in the business. Selecting the correct wiring is a critical step for any electrical project. Faulty wiring can cause malfunctions and even an overall system failure. With current technologies, incorrect wiring can result in voltage fluctuations or distortions that impair how a device performs. 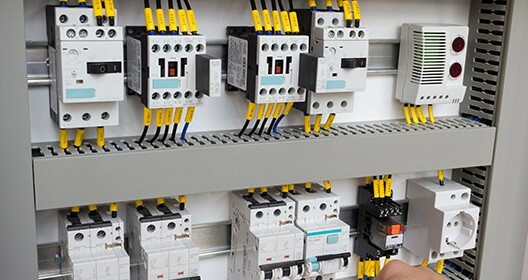 Whatever the cause, R & R AND SONS ELECTRICAL will resolve the faulty connections and restore a safe and stable electrical system for you. Whether your home or business needs emergency or non-emergency electrical services, our staff is ready 24 hours per day and every day of the week. As is the case with all services offered at R & R AND SONS, our work and products are guaranteed to meet your satisfaction. R & R AND SONS has the experience and the equipment for the installation and maintenance of distribution wiring, meter sockets, switch gears and many more related systems. Moving your business to new location is an exciting but can also pose quite a challenge. If you are moving or thinking about moving your business, call R & R AND SONS for all of your electrical upgrades. We’ve helped many of clients grow into a new location and would be happy to do the same for you. For our clients thinking about buying a new property, we offer impeccable inspection services that will save you money and valuable time. Our expert inspectors examine your potential new home or business and deliver a detailed report on what repairs should be done right away as well as in the long term. You’ll also receive suggestions on improvements that could avoid problems down the line and save you money. Electrical codes help maintain safety and prevent things like electrical fires or power outages. The electricians on our staff can perform a detailed inspection of your property to be sure your systems are in compliance with local standards. We can perform code updates on site during the inspection for your convenience. 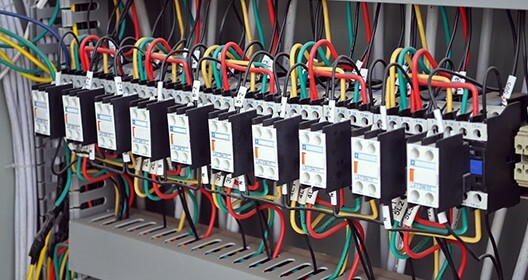 Our electricians can perform code corrections on commercial buildings or residences. R & R AND SONS ELECTRICAL provides a complete menu of tests that make sure your electrical systems are performing at peak efficiency. R & R AND SONS helps your business stay in operation and prevent costly downtime with our dependable maintenance programs. For your business to operate efficiently, your critical electrical systems have to be in working order. In the event of a power loss that renders cash registers, computers and phone lines down, a backup generator can put you back in business quickly and avoid lost revenue. R & R AND SONS can install a generator and uninterrupted power supply that safeguards you against unforeseen problems. 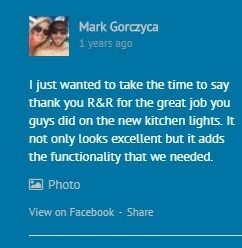 We couldn’t have asked for anything better than the service we received. From the initial contact, to the follow-up phone call, to the services rendered this was a fantastic example of how to get things done. R & R serviced my apartment on Friday. He was on time, explained everything (and showed me) and fixed it all. He was a nice guy! Also gave me many recommends. I agree completely with the last two reviews. I have nothing but good things to say about R & R Electricians and specifically about Ron. He was friendly, efficient, and professional. I have used them three times in two months and will continue to do so from here on. If you prefer that one of our electricians reach out to you via email, please click the button below with any questions, comments or concerns and we’ll respond as quick as we can. It’s our pleasure to keep our clients and potential customers happy and well informed.